The city closed the 54-year-old fishing pier in Pompano Beach on May 22. Construction of a new fishing pier has started in Pompano Beach to replace the city’s hurricane-damaged pier, which was built in 1963. The new $11.3 million pier will be feature canopy-shaded areas, public Wi-Fi service and an underwater camera for watching fish. 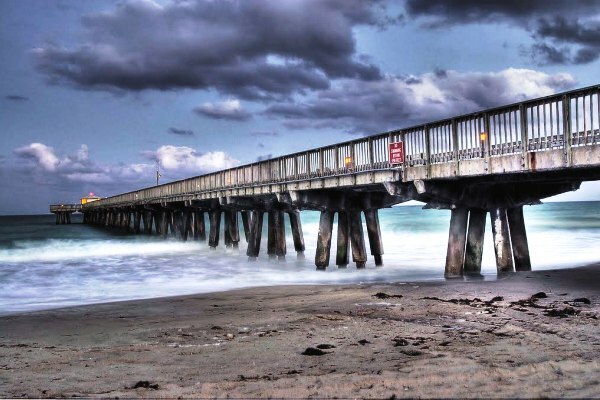 Hurricane Sandy sideswiped Pompano Beach in 2012 and damaged the 54-year-old fishing pier, which the city closed permanently on May 22. Hurricane Wilma in 2005 also damaged the old pier, which will be demolished. The new pier, scheduled to open in January 2019, will complement other developments in Pompano’s beachfront area, including a $20 million parking garage that opened in June 2016. The city also has improved its beachfront sidewalk and has buried the area’s utilities underground.